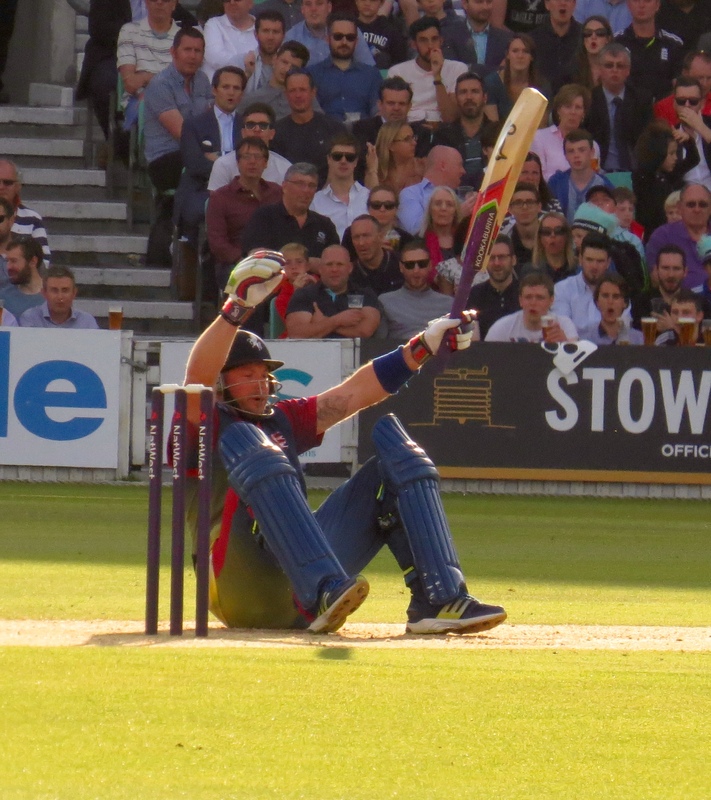 By strange coincidence I managed to do an impression of being a Kent fan, watching them 2 evenings in a row! 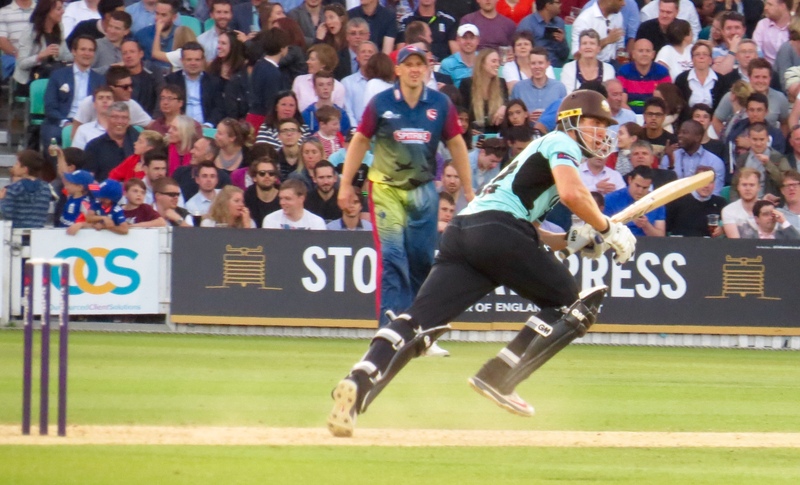 Mixing things up with my T20 viewing this season had me at the Oval for the visit of the Spitfires. 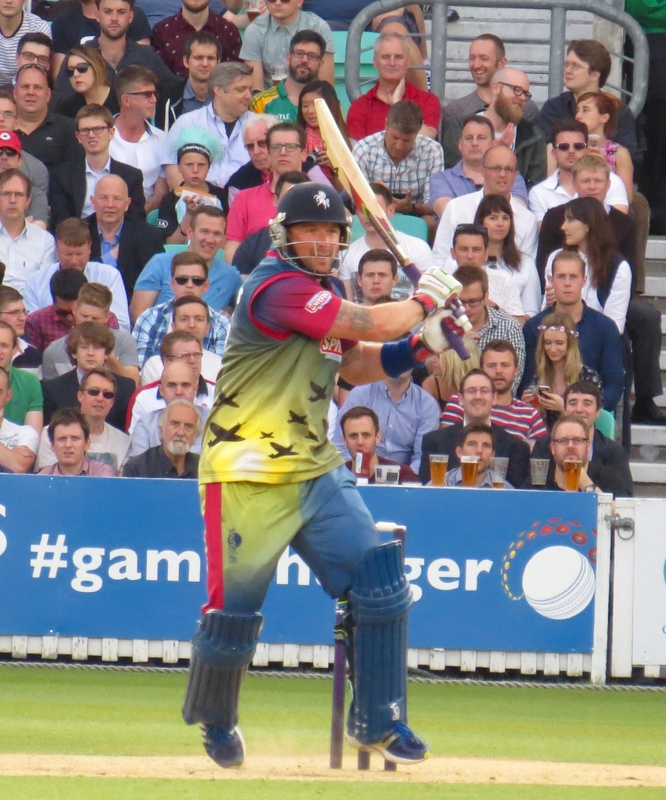 I had a morning of messing about with my photos from the game in Canterbury actually adding in a spot of housework too! 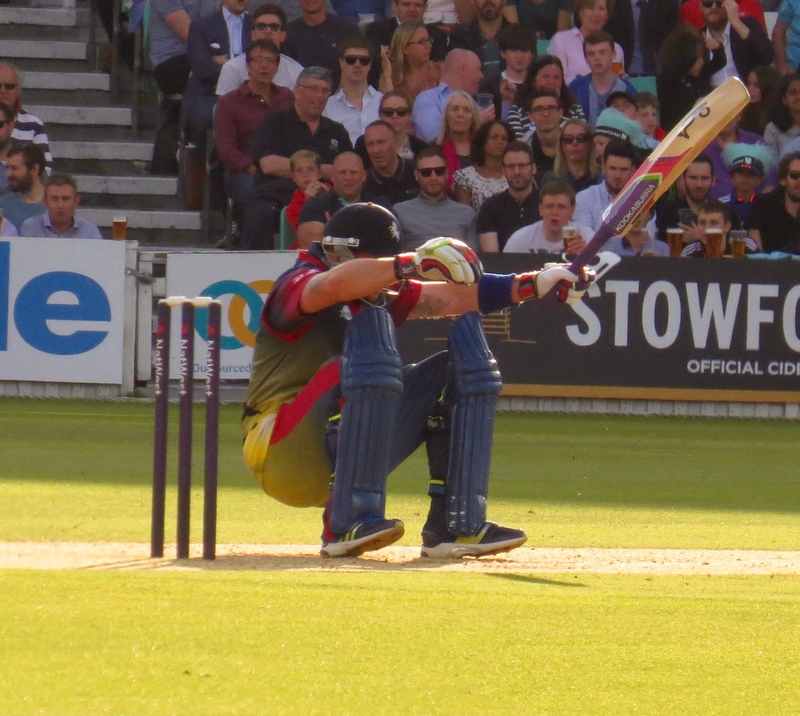 I did have to sit down for a while after that shock! I did my usual parking in the road rather than the scary station car park and headed into London from Shenfield. 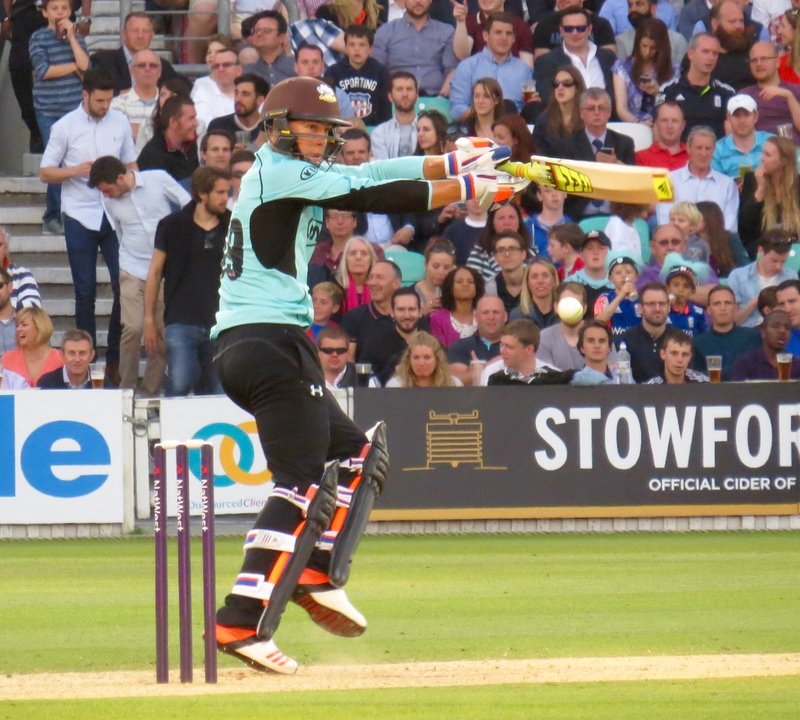 I was meeting a similarly cricket mad friend Sharneen – and picked Waterloo. I was a little early so was able to partake of cake! 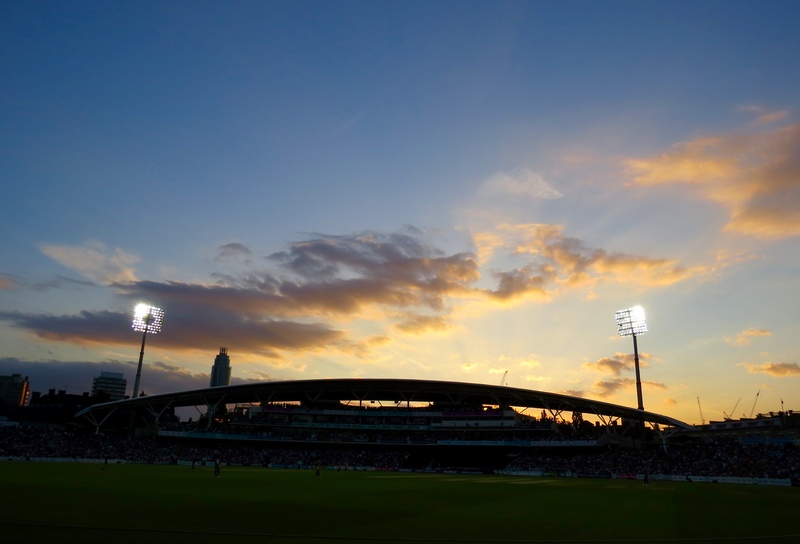 Always a delight! I think Sharneen thought I was leading her on a wild goose chase when we headed for South Bank – but I love walking along what is quite a calm river walk once past Westminster Bridge – I think I may have converted her too! 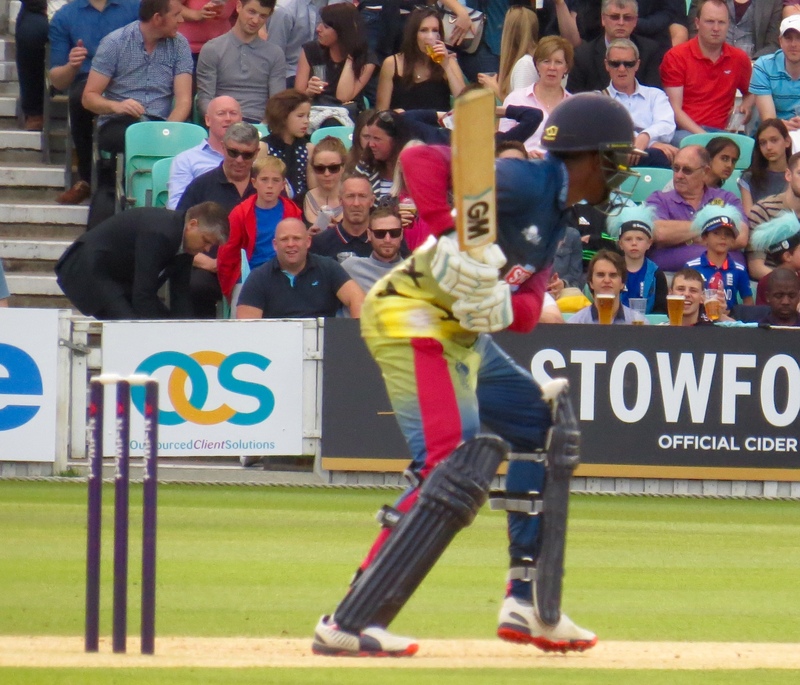 Sharneen is from South Africa – you’d think it’d be a given that her love of cricket came form her Dad, but it seems he’s not so keen – an Uncle who was late to marriage is the reason why! What a great way to form both a bond with a niece and this great game! 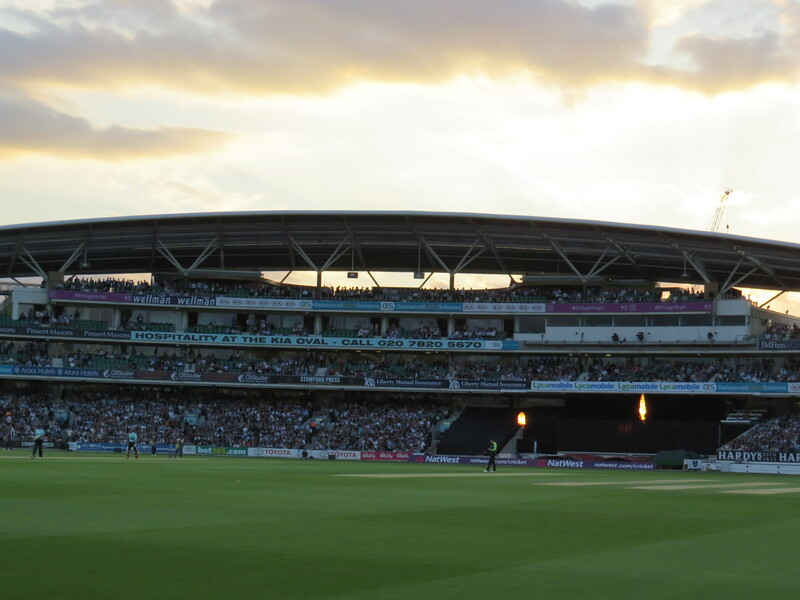 On arrival we went into the pavilion, having a look at this wonderful building from top to bottom – as well as convincing Sharneen on the way to get to the ground I have a feeling she’ll be a Surrey member before the week’s out! 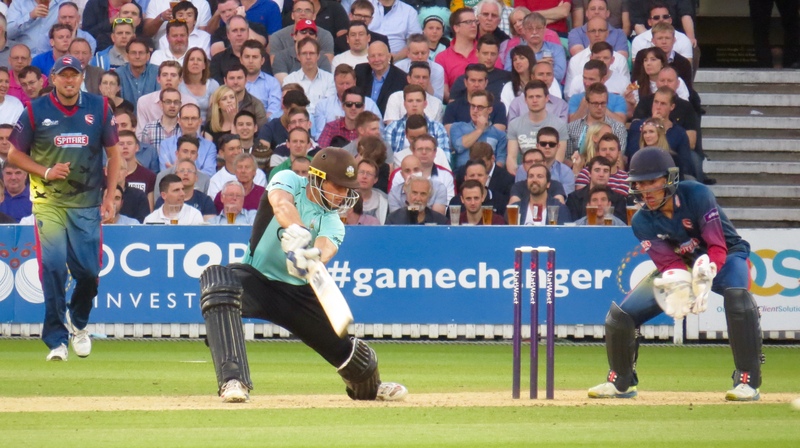 £194 a year to watch Surrey play every format of the game. 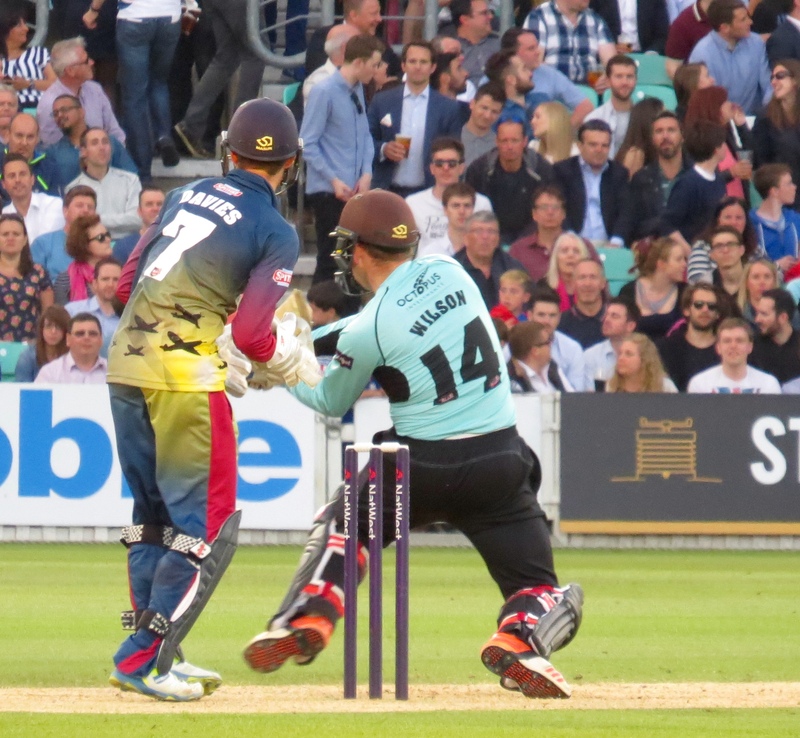 And in such wonderful surroundings – a no brainer! 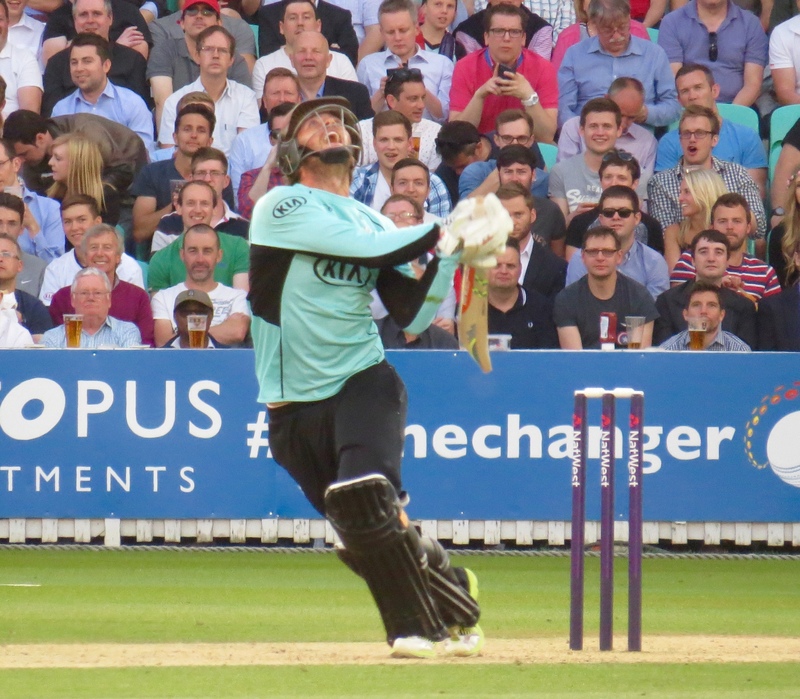 Yet again I’d believed the weather forecast and was expecting cloud – oh no! 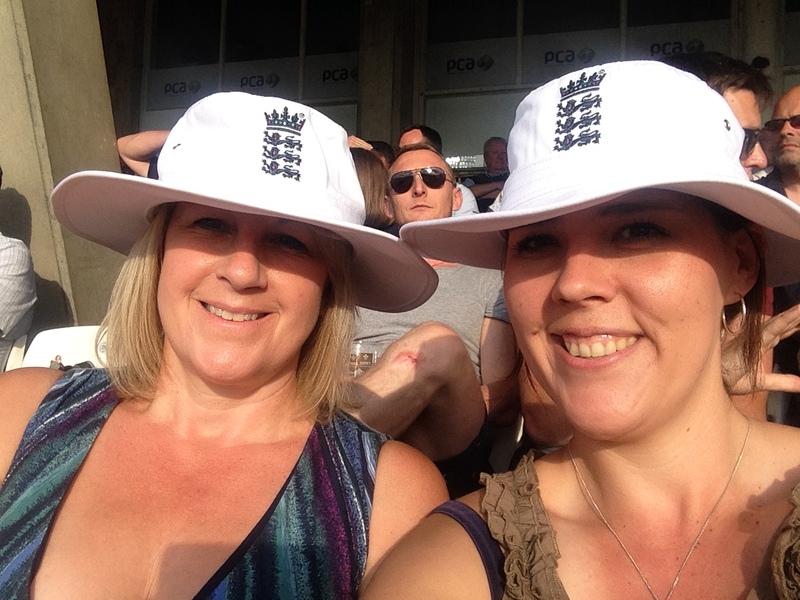 It was blazing sunshine again – and I hadn’t gone strapless! 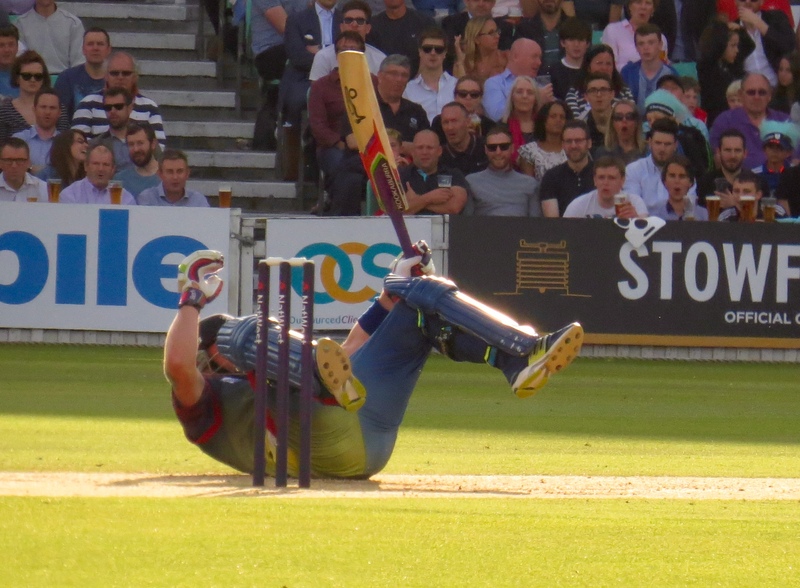 What a blow! 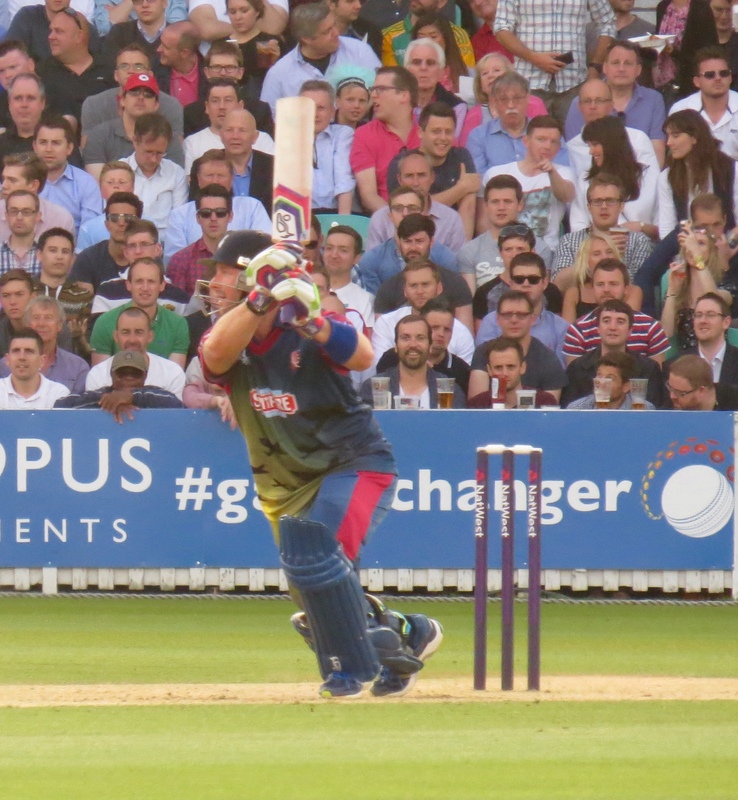 But, we took our seats in The Laker Stand having both bought a hat – not the best look – but needed! 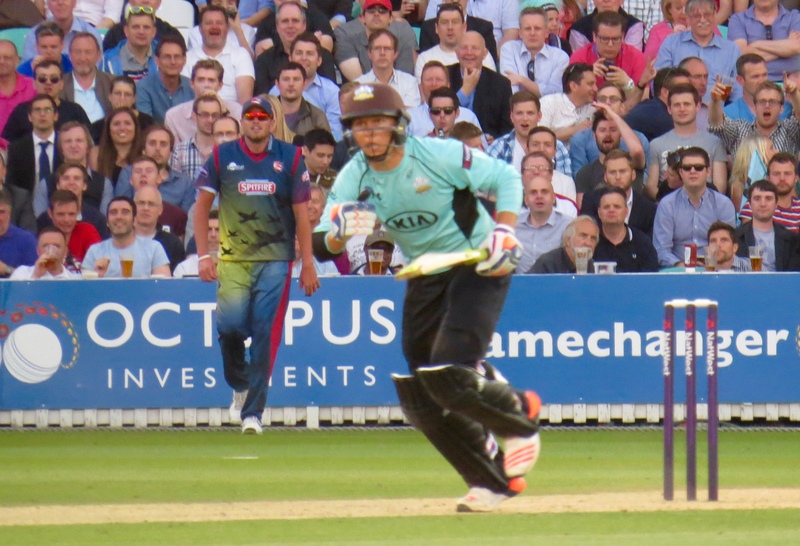 I have an Essex hat, but that wouldn’t be PC at The Oval! 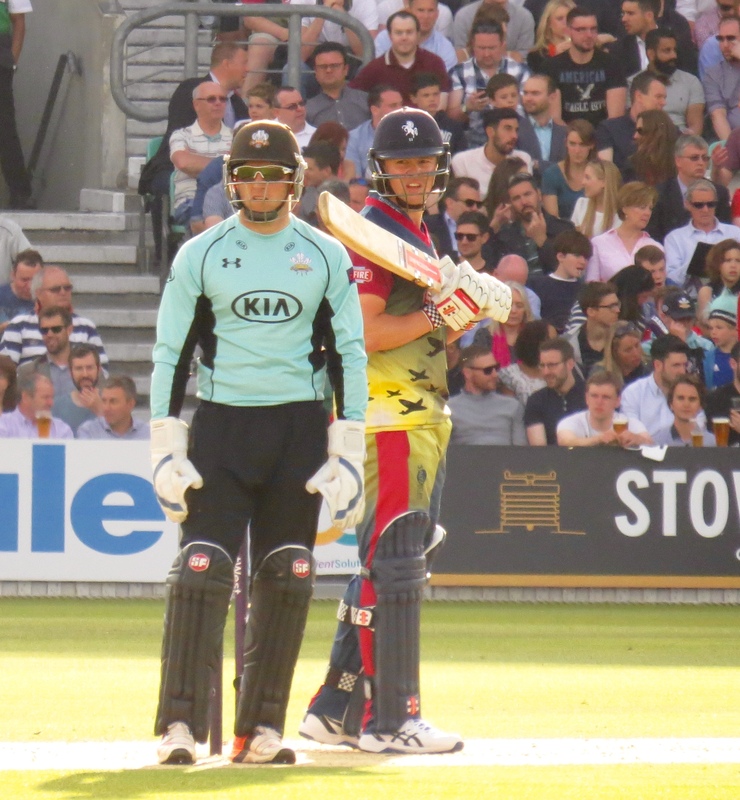 And so to the cricket -Kent won the toss and chose to bat – putting themselves in charge of the total this time. 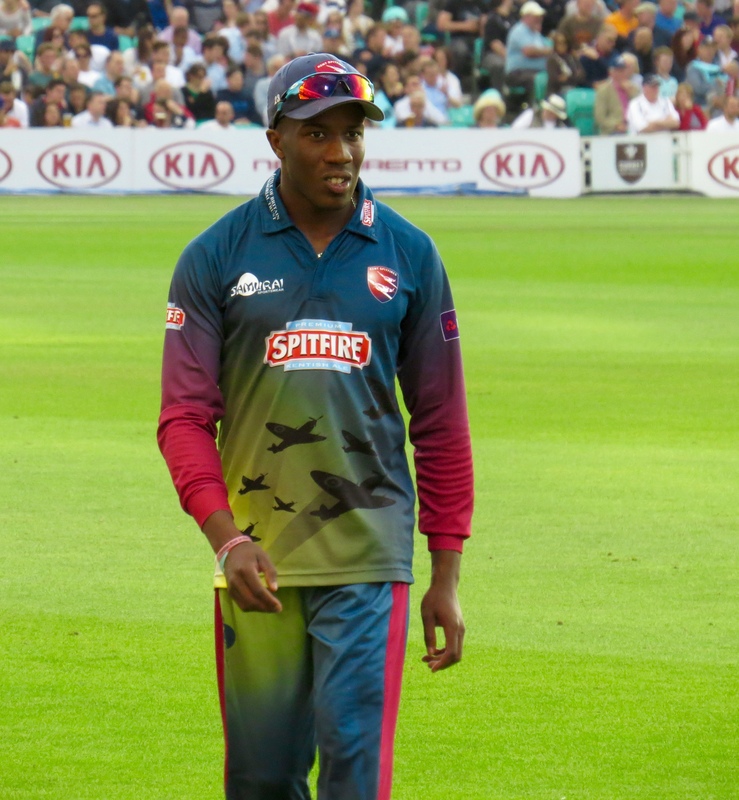 Daniel Bell-Drummond carried on where he’d left off the night before, opening with Joe Denly. 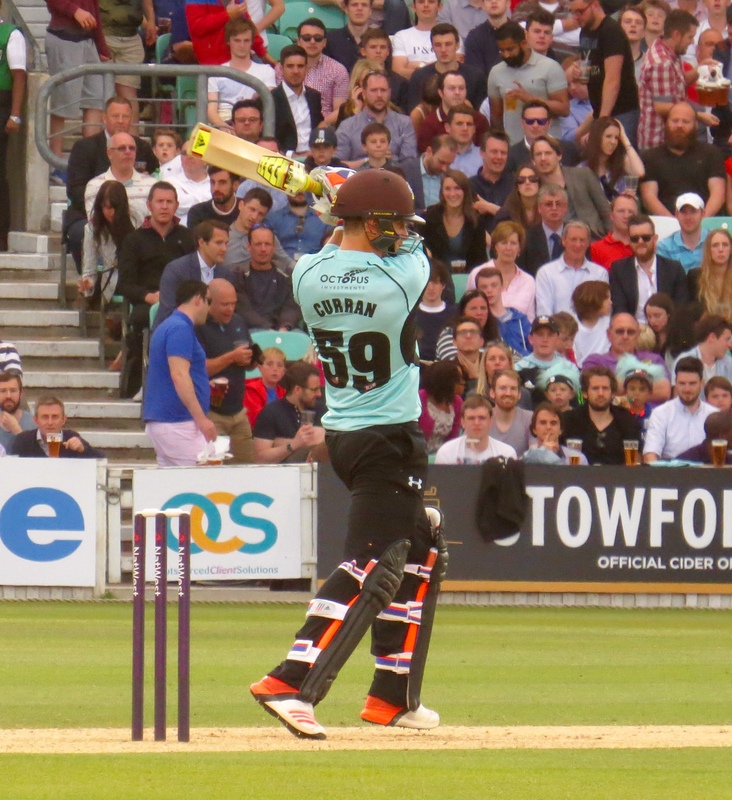 Things started well for Surrey when Zafar Ansari sent the stumps flying sending Denly back with 6 to his name and 7 on the scoreboard. 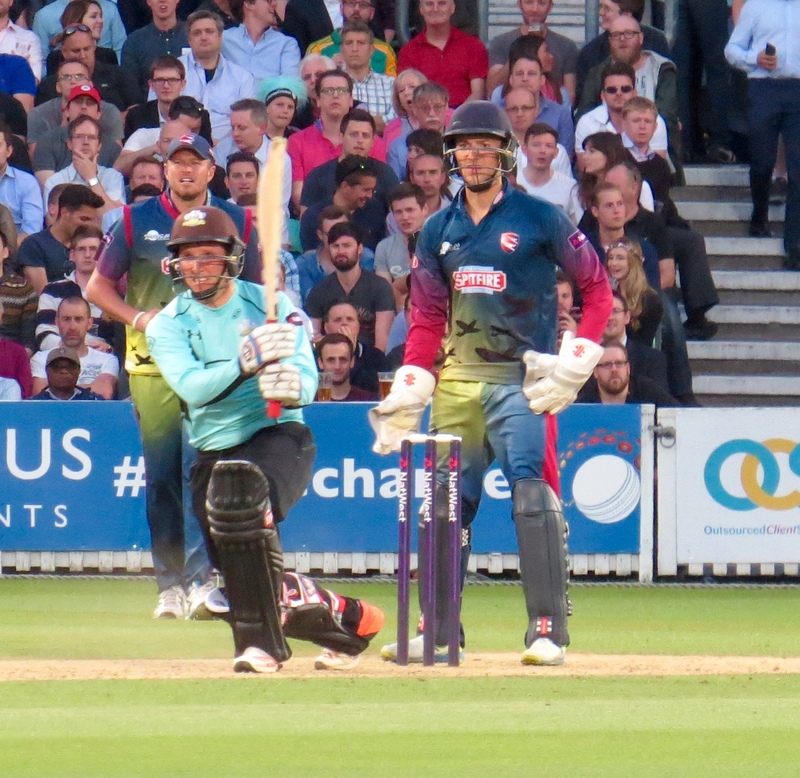 Sam Northeast came to join Bell-Drummond and the pair put on 57 before Northeast fell, again to Ansari – he was caught and bowled for 32 off 18 balls in 19 minutes. 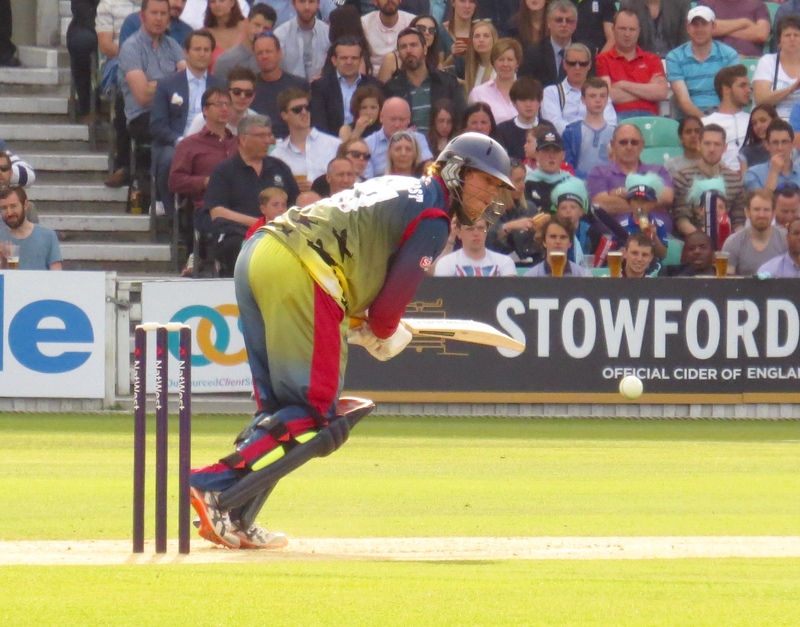 Fabian Cowdrey was next up. 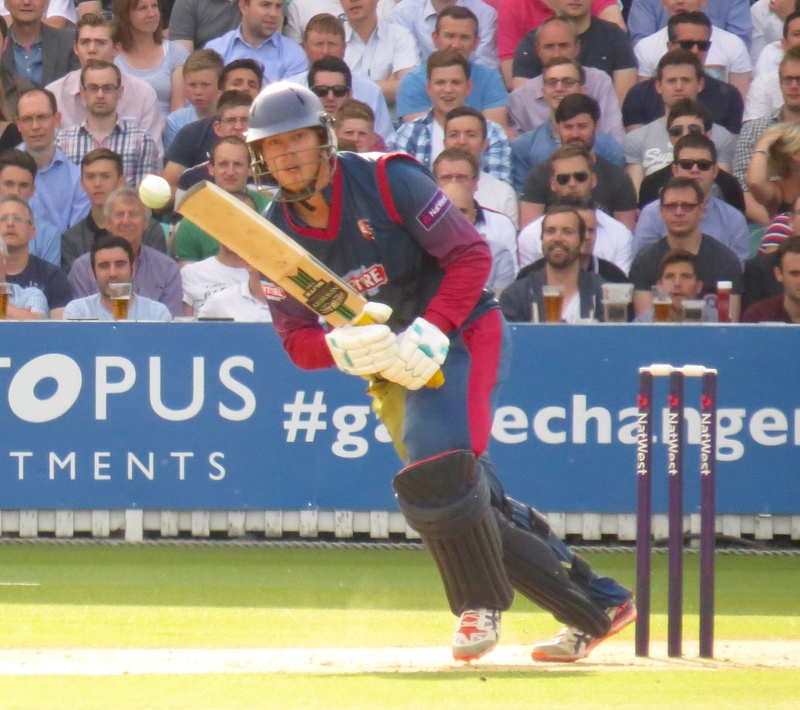 a swift 21 in 12 minutes helped the total grow before he fell to a catch by James Burke from the bowling of Tim Linley. 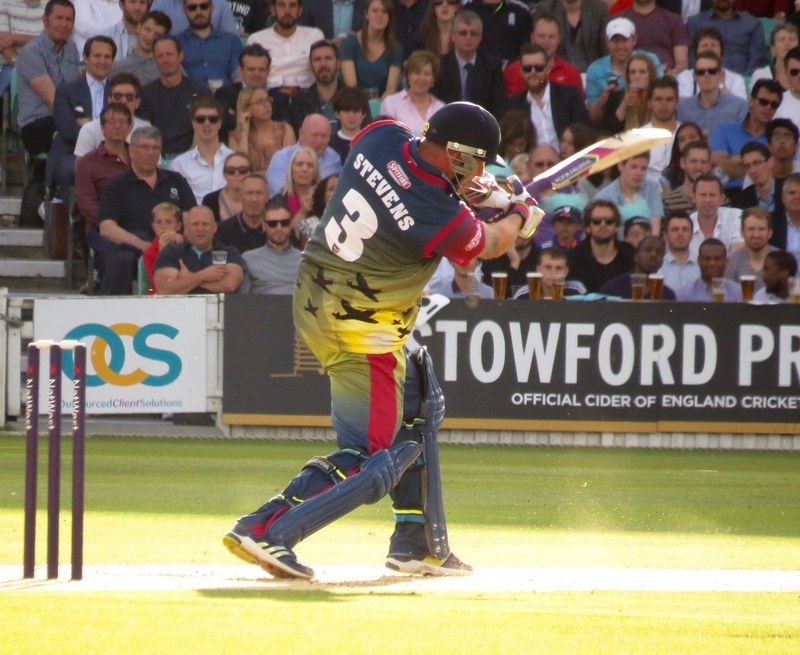 And so Darren Stevens arrived at the crease – I didn’t have too much to write about the Kent innings against Essex as 2 men pretty much carried the game; Stevens had a couple of partners to keep him company, but he played a wonderful innings. 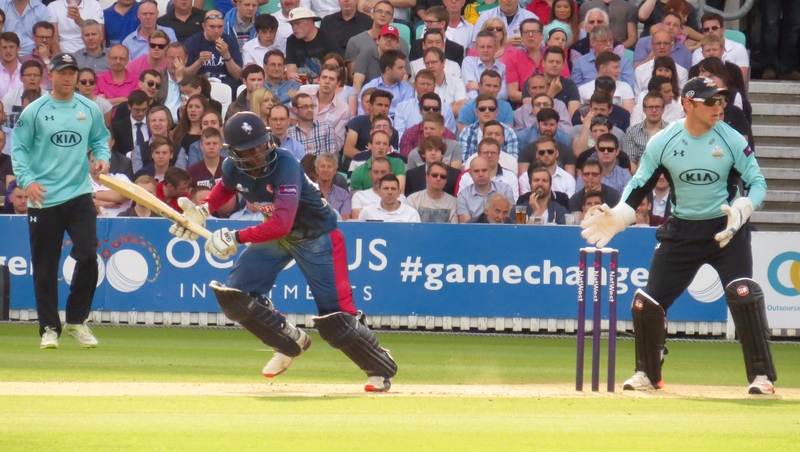 Bell-Drummond – steady again – scored 38 in his 42 minutes before Vikram Solanki caught him from the bowling of James Burke. 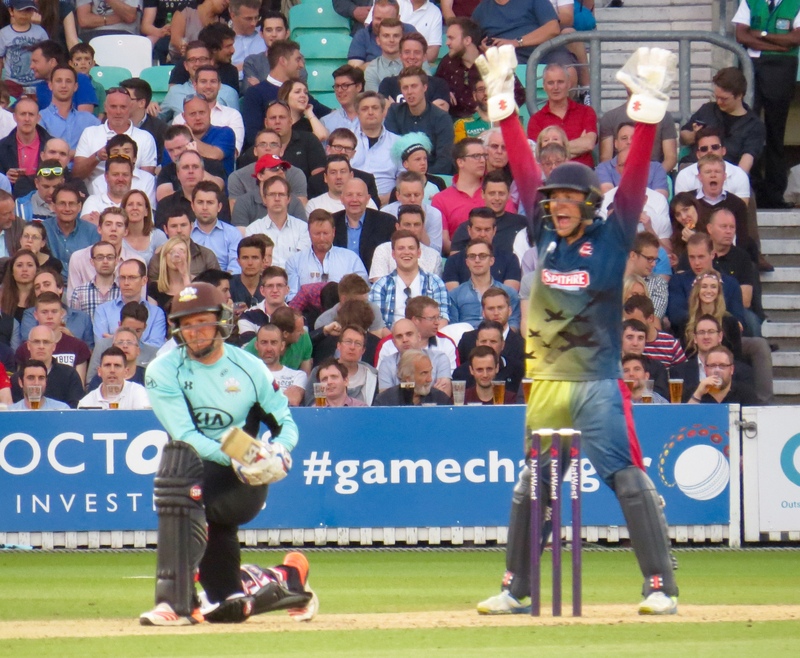 The scoreboard was ticking along fairly steadily, Stevens had been joined by Alex Blake. 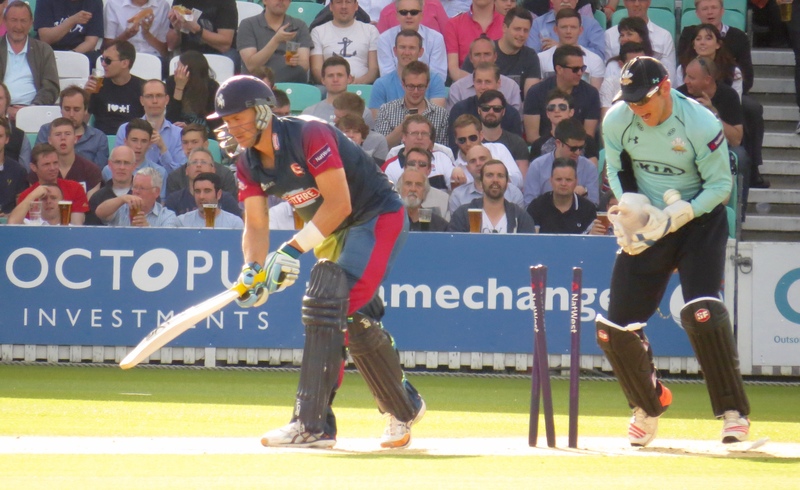 I’ve eluded to Stevens’ innings – he scored 90 runs from 39 balls! 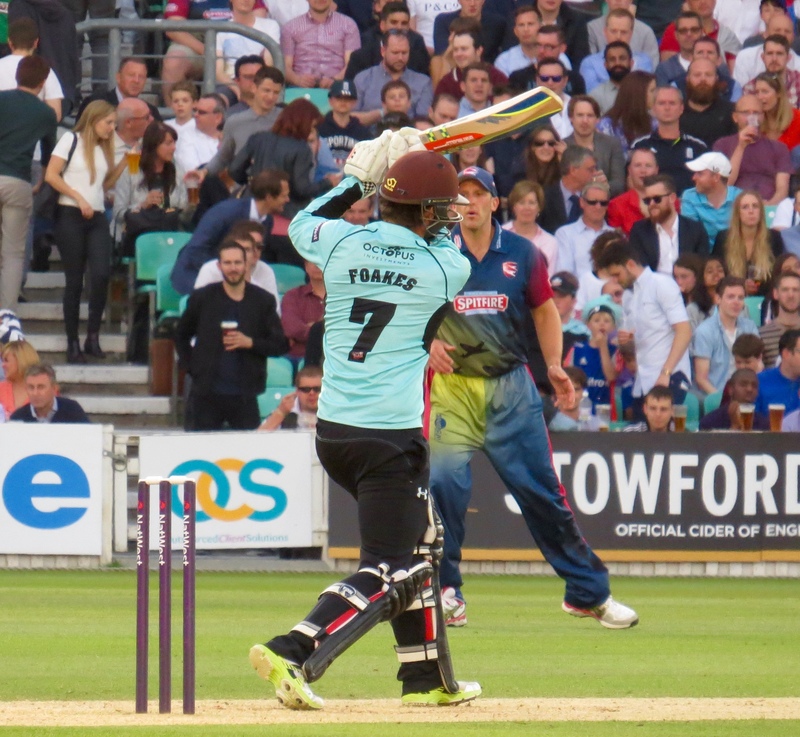 Hitting ten 4’s and five 6’s – he totally deserved to leave the field with a century to his name but was caught by Ben Foakes from the bowling of Tim Linley. 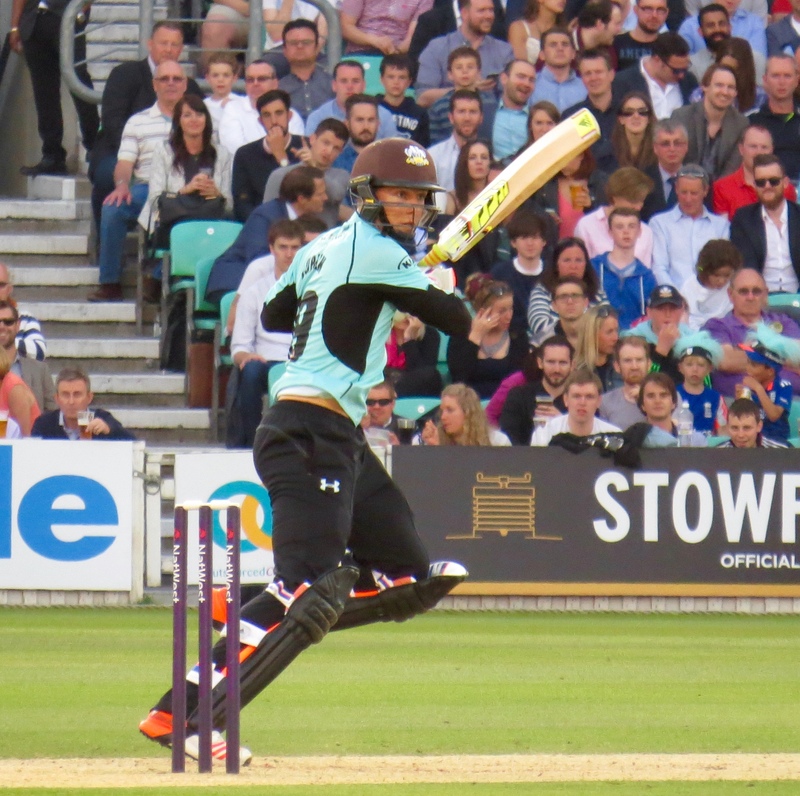 Blake was next to fall having hit a very handy 27 from 18 balls, he was caught by Sam Curran, again with Linley being the bowler. 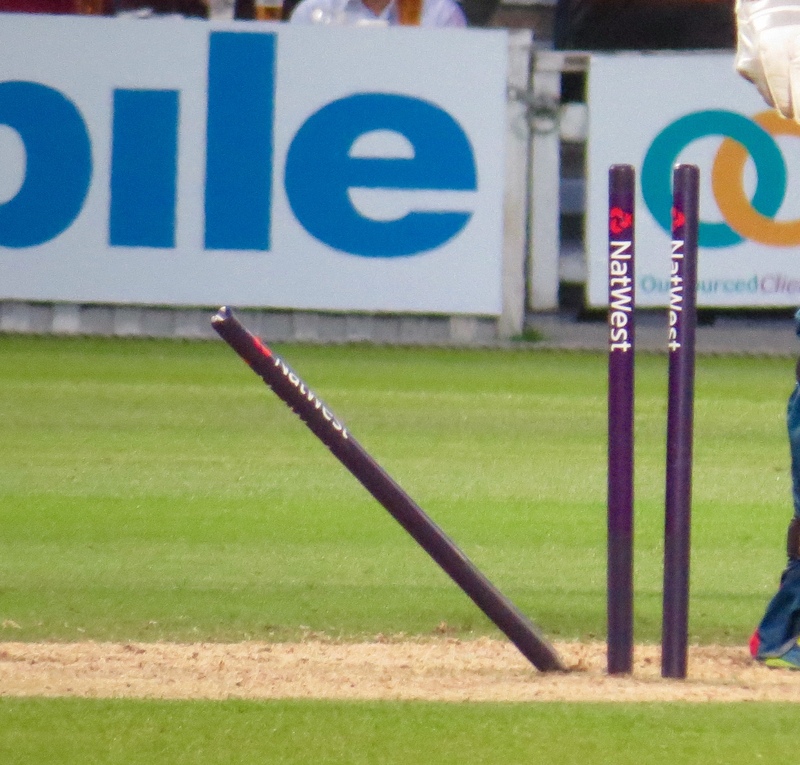 Linley accounted for Ryan Davies on the last ball as he was caught by Solanki. 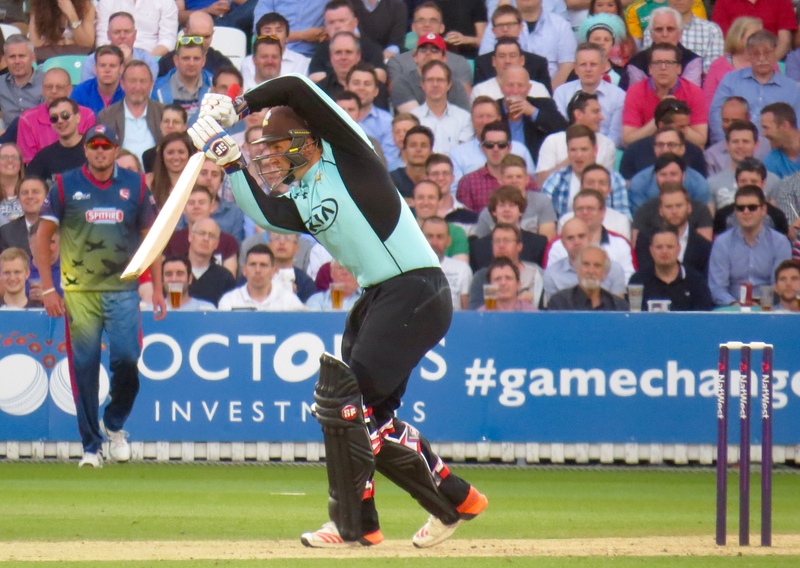 The net effect of Stevens and company was a huge 231 for Surrey to chase! By anyone’s standards that was a huge hill to a climb, to a team struggling this season it must have looked a nightmare! 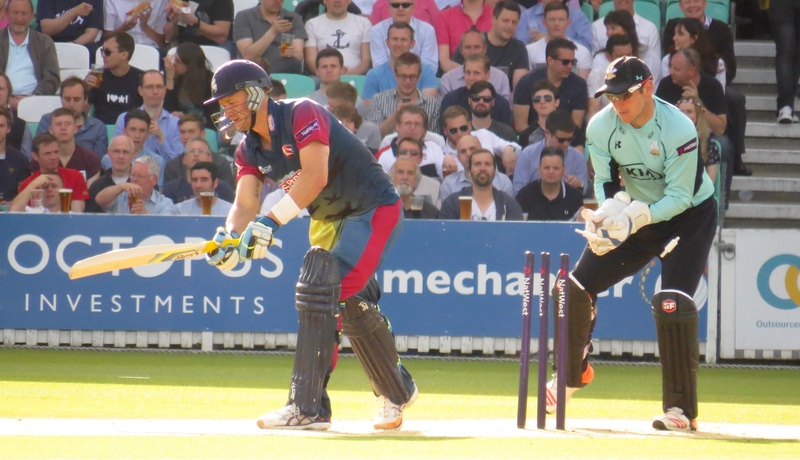 Again things started badly for the batting team as Aneesh Kapil was bowled by none other than Darren Stevens with the 3rd ball! 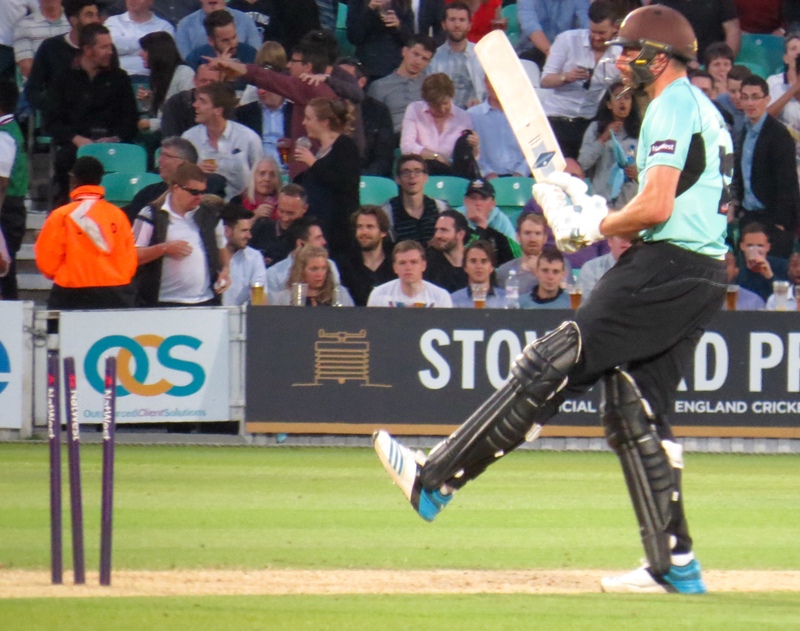 Ben Foakes came in with Surrey on 1 for 1 – a further 32 runs were put on before James Tredwell, with an athletic effort caught him from the bowling of Ivan Thomas. 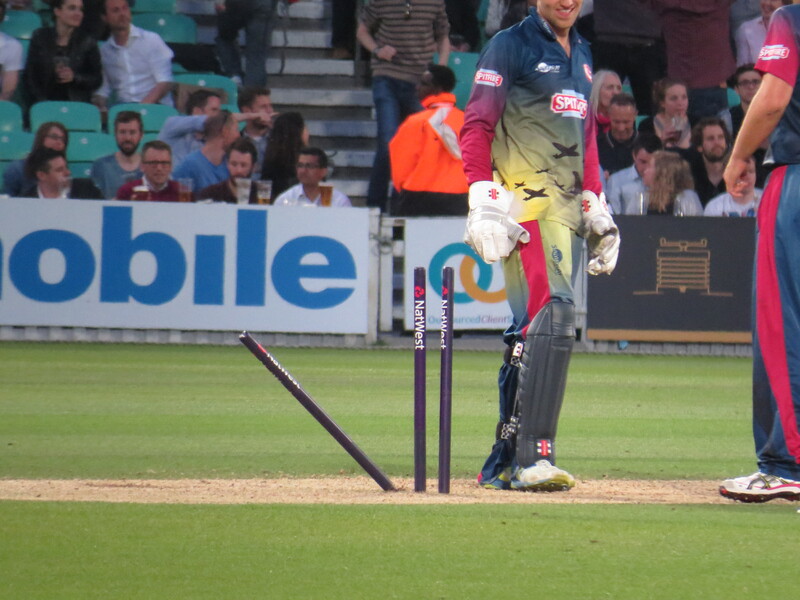 Gary Wilson joined Tom Curran who’d opened he was going well with Wilson until they decided to take a totally unnecessary 2nd run, Joe Denly reacted quickly and Curran was run out! He had 41 to his name. 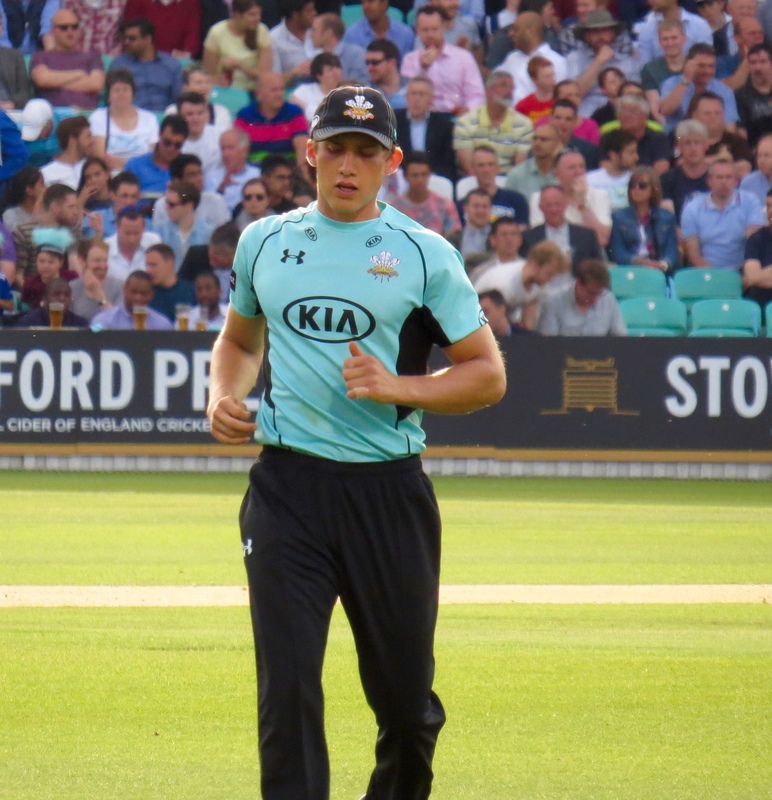 Zafar Ansari added 33 runs to his game in the 20 minutes he was on the field – he was caught by Ivan Thomas from the bowling of that man Stevens! 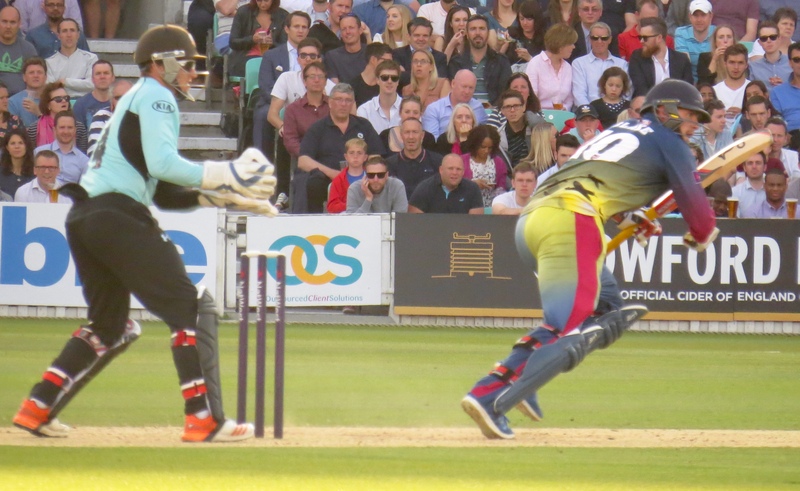 In the meantime Wilson was building a good total of 55 runs he saw Vikram Solanki come and go, he was caught by Ryan Davies from the bowling of Matt Coles for 8 runs. 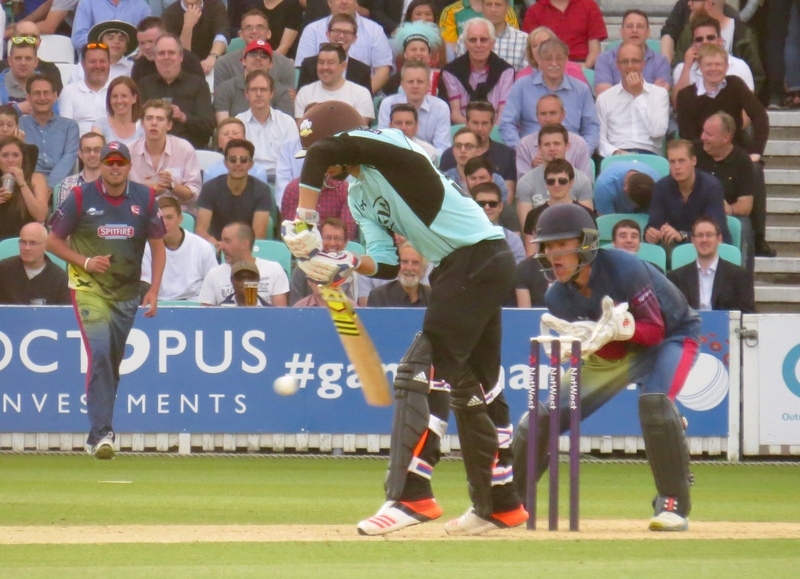 Wilson became another victim of Stevens, being caught by Mitchell Claydon. 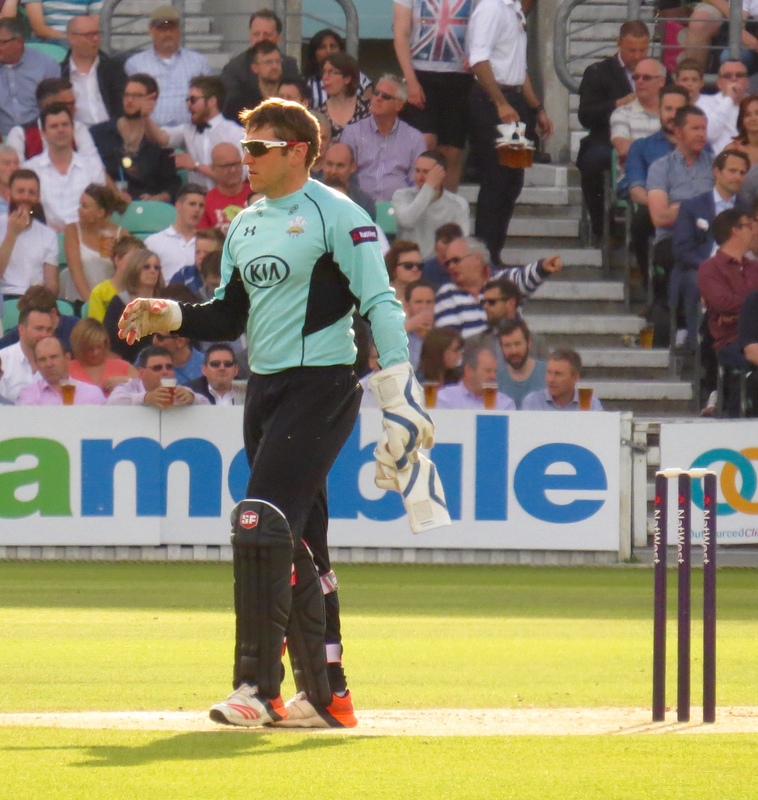 Stevens added James Burke to his tally giving him 90 runs and 4 wickets – I presume he was Man of The Match! 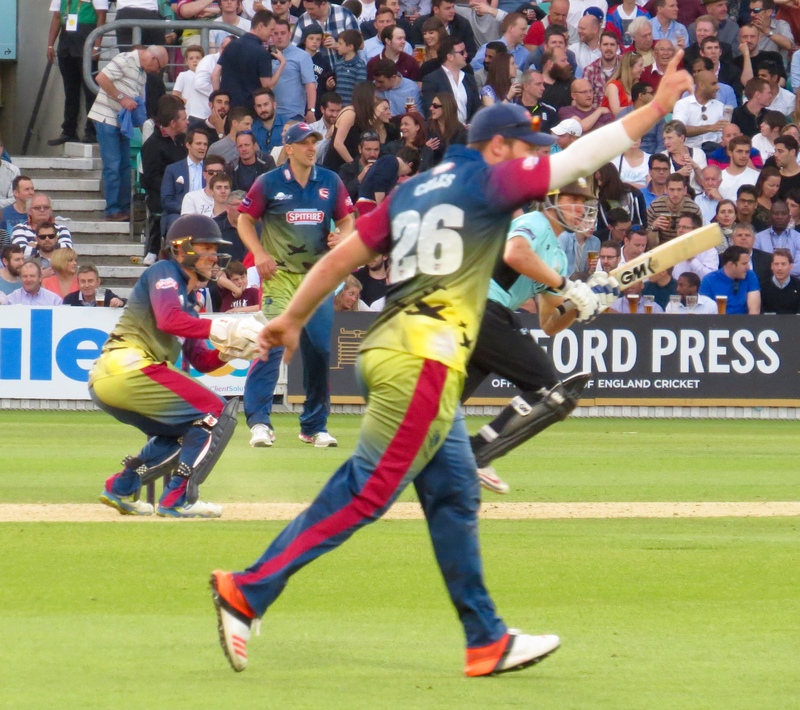 Mitchell Claydon cleared up the tail end, bowling Sam Curran, Tim Linley and Matt Dunn! 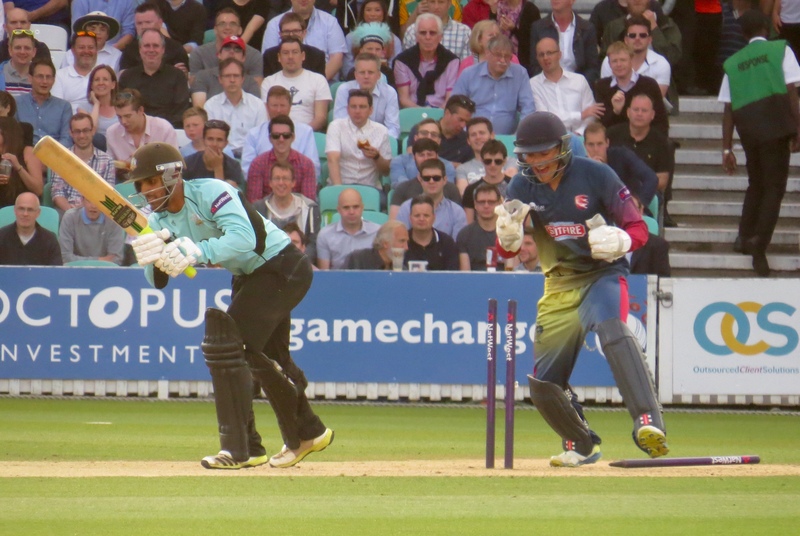 Surrey batted for the full 20 overs but amassed only 177 runs. 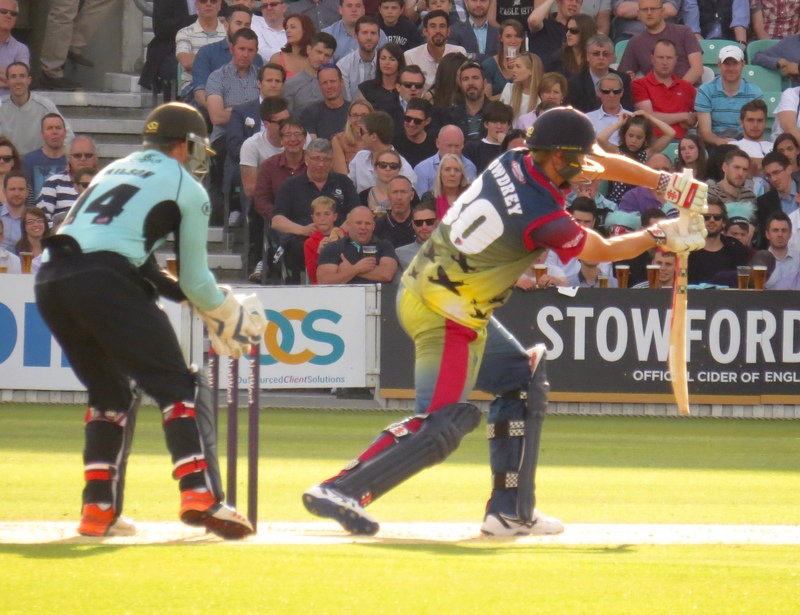 Kent took the points home with them, a good couple of T20 days for them – they sit at the top of the South table with 12 points from their 9 games. 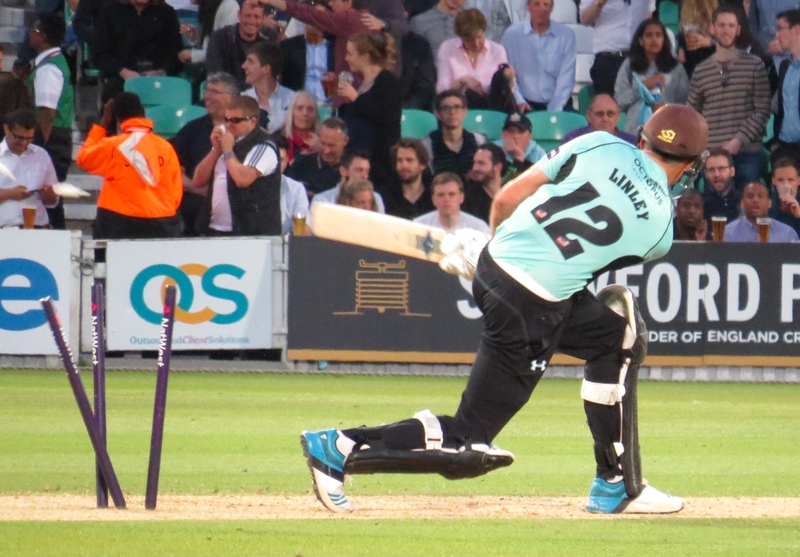 Surrey on the other hand languish at the bottom on 4 points from 7. Sharneen and I chose the walk back to Waterloo option, which held a small element of excitement as Stella was being filmed along the riverbank! 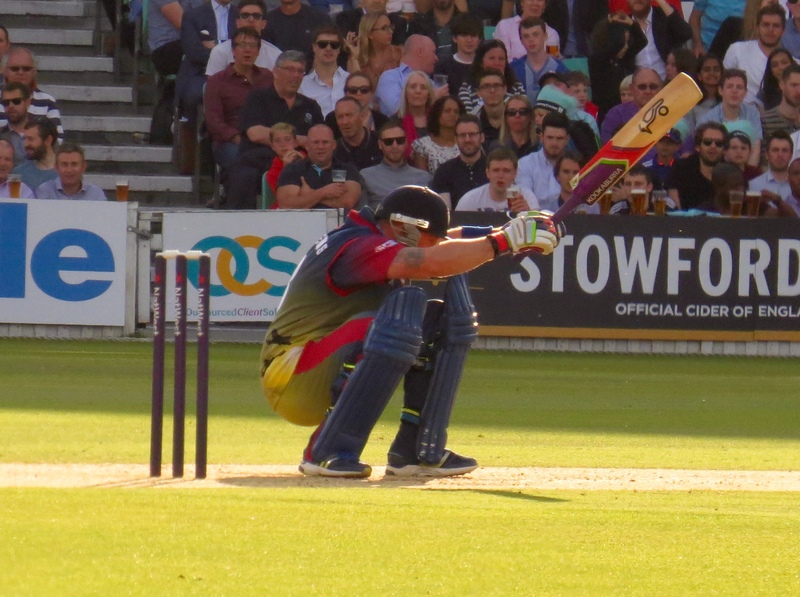 That added a little something to what was a lovely evening!